2. Institute of Materials Research and Engineering (IMRE), Agency for Science, Technology and Research (A*STAR), Singapore 117602. Currently, precision theranostics have been extensively demanded for the effective treatment of various human diseases. Currently, efficient therapy at the targeted disease areas still remains challenging since most available drug molecules lack of selectivity to the pathological sites. Among different approaches, light-mediated therapeutic strategy has recently emerged as a promising and powerful tool to precisely control the activation of therapeutic reagents and imaging probes in vitro and in vivo, mostly attributed to its unique properties including minimally invasive capability and highly spatiotemporal resolution. Although it has achieved initial success, the conventional strategies for light-mediated theranostics are mostly based on the light with short wavelength (e.g., UV or visible light), which may usually suffer from several undesired drawbacks, such as limited tissue penetration depth, unavoidable light absorption/scattering and potential phototoxicity to healthy tissues, etc. Therefore, a near-infrared (NIR) light-mediated approach on the basis of long-wavelength light (700-1000 nm) irradiation, which displays deep-tissue penetration, minimized photo-damage and low autofluoresence in living systems, has been proposed as an inspiring alternative for precisely phototherapeutic applications in the last decades. Despite numerous NIR light-responsive molecules have been currently proposed for clinical applications, several inherent drawbacks, such as troublesome synthetic procedures, low water solubility and limited accumulation abilities in targeted areas, heavily restrict their applications in deep-tissue therapeutic and imaging studies. Thanks to the amazing properties of several nanomaterials with large extinction coefficient in the NIR region, the construction of NIR light responsive nanoplatforms with multifunctions have become promising approaches for deep-seated diseases diagnosis and therapy. In this review, we summarized various light-triggered theranostic strategies and introduced their great advances in biomedical applications in recent years. Moreover, some other promising light-assisted techniques, such as photoacoustic and Cerenkov radiation, were also systemically discussed. Finally, the potential challenges and future perspectives for light-mediated deep-tissue diagnosis and therapeutics were proposed. Keywords: precision theranostics, near-infrared light, multifunctional nanomaterials, photoacoustic, Cerenkov radiation. In recent decades, precision medicine has received considerable attention in clinics due to its significant roles in the effective treatment of various human diseases [1-4]. While some advances in the precision medicine have been made, issues in the low accumulation of therapeutic molecules and contrast agents in the targeted disease areas, and meanwhile, harmful effects to healthy tissues still need to be addressed [5-7]. Thereby, the rational design of “smart” platforms with optimal performance in theranostics while minimizing systemic side effects will be of significance for clinical applications. So far, numerous stimuli-responsive platforms have been considered as ideal therapeutic approaches for effective therapy and relevant biomedical imaging [8-10]. Briefly, these strategies include endogenous stimuli (such as pH, enzyme and redox reactions, etc) and exogenous stimuli (such as light, ionizing irradiation, magnetic field, etc) [11, 12]. Among various methods, the light-mediated therapy has shown great superiority in achieving on-demand therapeutics and diagnostics in targeted areas in vitro and in vivo, owing to their non-invasiveness and spatiotemporal precision upon a specific wavelength light irradiation [13-15]. Especially, with the latest innovations in chemistry and nanotechnology, numerous promising nanomaterials, such as gold nanoparticles (AuNPs) [16, 17], upconversion nanoparticles (UCNPs) [18, 19], quantum dots (QDs) [20, 21] and carbon nanomaterials (CNMs) [22, 23] etc, have been integrated with therapeutic agents for fabrication of photo-responsive systems. The great benefits from their tunable size and shape, optimal photo-physical property and easy surface modification provide more success in the rational design of precisely light-controlled platforms toward the specific regulation of theranostic activities at targeted diseases areas both in vitro and in vivo. Until now, various photolabile or photoactivatable therapeutic systems have been extensively established in the light-responsive drug delivery, photodynamic therapy and photothermal therapy in living subjects [24-26]. By right, the commonly used excitation wavelength in theranostics heavily rely on short-wavelength light (e.g., ultraviolet (UV) and visible light), which has limited tissue penetration depth owing to the inherent absorption/scattering of some endogenous light absorbers including water, lipids and protein molecules including hemoglobin (Hb) and oxyhemoglobin (HbO2) in living subjects [27, 28]. In order to further improve the tissue penetration in the deep-seated pathological areas for light-controlled therapy and imaging, new light sources and photo-responsive reaction systems are highly demanded. Nowadays, one inspiring approach to deal with these challenges is to utilize the long-wavelength near-infrared (NIR) light in the range of 700~1000 nm, termed as “NIR window” or “optical window” (Figure 1) [11, 29]. Typically, NIR light irradiation displays minimum absorption in living subjects, achieving better tissue penetration depth (e.g. < 10 cm) than UV or visible light (e.g., < 1 cm) [30, 31], which is also expected to exhibit minimal photodamage to biomolecules, cells and tissues. Currently, numerous drug active agents or probe molecules with large absorbance in the NIR window have been pursued and applied in clinics for deep-tissue therapeutics and imaging [32-34]. However, several inherent drawbacks, such as tedious synthetic procedures, low water solubility and limited accumulation properties in targeted areas, heavily restrict their further clinical applications. Fortunately, some novel nanomaterials (e.g., AuNPs, UCNPs, CNMs, etc) with a large extinction coefficient in the NIR region, have recently become promising candidates in the field of NIR light-mediated theranostics, which could harvest NIR photons and generate cytotoxic moieties (e.g., ROS, heat, etc) for effective diseases treatment seated in deep tissues . Moreover, these nanomaterials provide significant platform for the integration of multiple functionalities in a single construct, which could thus facilitate the synergistic disease diagnosis, therapy, and real-time monitoring in vitro and in vivo . Illustration of light-mediated theranostics under UV, visible and NIR light irradiation. UV light-mediated photocaged strategies. (A) Brief scheme of UV light-induced photocaged compounds: (a) o-nitrobenzyl, (b) pyrenylmethyl ester, (c) coumarinyl ester. (B) Schematic illustration of UV light-induced release of D-luciferin from the ONB photocaged D-luciferin derivatives structures for the detection of fLuc. Bioluminescence imaging was performed in mice bearing C6-fLuc tumors after injection with: (a) compound Lu-NPE without UV excitation; (b) compound Lu-NPE with UV excitation; (c) D-luciferin only, respectively. Reproduced with permission from reference . (C) Scheme of photo-activated drug release from assembled photosensitive DNA-drug nanoconjugates. Reproduced with permission from reference . In this review, we summarized recent advances of light-mediated strategies for effective theranostics in biomedical applications. Such light-triggered photoactivation will be presented based on the wavelength of light sources ranging from UV, visible to NIR window. Furthermore, in order to achieve improved therapeutic effects with better tissue penetration, several recently developed light-assisted techniques, including photoacoustic (PA) [37, 38] and Cerenkov radiation (CR)  through integrating light with ultrasound or X-ray irradiation respectively, will also be covered. Finally, the potential challenges and future perspectives for light-mediated deep-tissue diagnosis and therapeutics were also discussed. Currently, the commonly used approaches to achieve light-triggered theranostics mostly involve in the higher energy excitation at UV or short-wavelength range (< 400 nm), in which some photolabile or photoactivatable systems can sensitively respond to the photo irradiation and thus induce the controlled therapy and imaging at targeted locations. In this section, the rational design through the photoactivation of caged molecules and the controlled delivery on the basis of the light-activated structural isomerization will be first discussed. Briefly, light-triggered photocaged strategy is to utilize a beam of light (usually at short-wavelength UV window) to activate a photocleavable functional group that block the activity of therapeutic molecules, thus achieve the precisely light-controlled drug release in pathological regions. In the last decades, various photocaged molecules, such as o-nitrobenzyl (ONB) [40-42], pyrenylmethyl ester  and coumarinyl ester [44, 45], etc (Figure 2A), have been established for spatiotemporally regulating bimolecular activities, real-time monitoring cell trafficking and controlled release of therapeutic molecules in vitro and in vivo. For instance, Xing and co-workers synthesized a set of stable and efficient photoactivable D-luciferin probe molecules to real-time image firefly luciferase (fLuc) bioluminescence reporter in vitro and in vivo (Figure 2B) . Initially, the bioactivity of D-luciferin was blocked owing to the deactivation of 6-hydroxy group in D-luciferin by different nitrobenzene groups. With UV light illumination at 365 nm, these photocaged probes will be rapidly released to recover the activity of D-luciferin, which present robust bioluminescence imaging in living mice. Lu et al. also reported an effective method to prepare photo-removable protecting groups on the DNAzymes. Upon UV light irradiation, the photoactive groups were cleaved and the DNAzyme activity was restored for sensing metal ions in living systems . Moreover, the photorelease of several anti-cancer reagents, such as doxorubicin (Dox) , paclitaxel (Taxol)  and camptothecin (CPT)  etc, has also been extensively investigated for UV light-mediated photoactivation in cancer therapy. For example, Dcona et al. developed an efficient strategy to control the release of Dox based on photocaged permeability (PCP) change of prodrug. In this system, a cell impermeable small molecule was linked with the Dox via photo-cleaved linker, which could be cleaved upon UV light activation, allowing cellular entry of drugs and therapeutic activity in cancer cells . Besides photo-activated applications through organic molecules, the photocaged strategies can also be utilized based on nanotechnologies for therapeutic studies in vitro and in vivo. For example, Yeh and co-workers established a photo-cleaved nanoconjugate through attaching ONB modified folate groups on the surface of AuNPs. Upon UV light activation, this nanoplatform could selectively target tumor cells and release cytotoxic drug (Taxol) for cancer therapy . Marina et al. also presented a novel photoactive drug delivery nanocarrier based on mesoporous silica nanoparticles (MSNs) for antitumor therapy . Typically, a protein shell anchored on the MSN surface through UV-sensitive cross-linker acted as a targeting agent. Once internalized, it can effectively release cytotoxic drugs upon UV light activation, and thus induce the apoptotic cascade in cancer cells. In addition to the conventionally used inorganic nanomaterials, the photoactive nanoplatforms based on intrinsic bio-degradable molecules (e.g. DNA, proteins etc.) have also been proposed for the light-controlled theranostics in recent years. For example, Tan et al. demonstrated a novel nucleic acid-based nanostructure to specifically regulate the release of anticancer drugs (CPT) (Figure 2C) . Upon UV light exposure, the self-assembled nanostructure decomposed the nucleic acid shell and disintegrated the hydrophobic CPT core by irreversible photocaged strategy, resulting in effective therapeutics towards cancer cells. UV light-mediated photoisomerization strategies. (A) Commonly used molecular structures with UV light-triggered reversible conformational exchanges. (a) azobenzene, (b) spiropyran, (c) diarylethene. 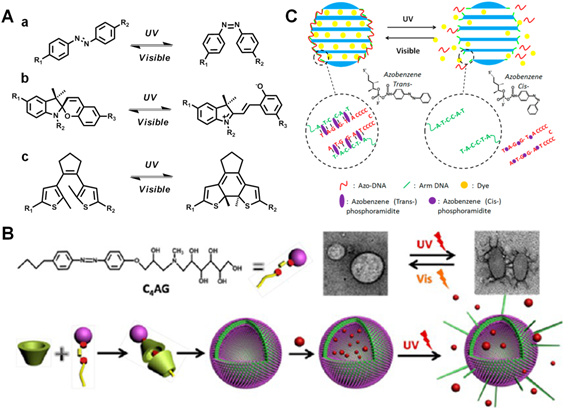 (B) Scheme of UV light-induced drug release from the self-assembled vesicles. TEM showed the reversible morphology change of vesicles in the presence of UV/visible light irradiation. Reproduced with permission from reference . (C) Scheme of azobezene-modified DNA-controlled reversible drug photorelease system. Reproduced with permission from reference . Different from the irreversible photocaged method, another promising approach to achieve UV light-controlled therapy will mostly involve in the design through reversible photoisomerization, in which these photo-responsive moieties could achieve conformational exchanges from trans to cis states, and thus lead to controlled drug release in the targeted regions after UV light irradiation. So far, numerous photosensitive structures such as azobenzene [52, 53], spiropyran [56, 57] and diarylethene [58, 59] etc (Figure 3A), have been well utilized for the light-mediated bioimaging and therapy. For instance, Zhao et al. fabricated a smart self-assembled vesicle via the host-guest interaction between azobenzene derivative and β-cyclodextrin (β-CD) (Figure 3B) . In the presence of UV light illumination, the trans-azobenzene group in the cavity of β-CD could process photoisomerization to cis- status, inducing the effective drugs release in cancer cells. More importantly, this smart vesicle was able to undergo reversible and repeatable process upon alternative UV/visible light irradiation. Similarly, Yuan et al. have also constructed a light-manipulated MSNs delivery cargo, which was functionalized with azobenzene-modified DNA double strands (Figure 3C) . The azobenzene labeled complementary DNA could undergo hybridization/dehybridization switch under UV/visible light illumination, which resulted in close/open status of pore gates in MSNs to control the release of loaded Dox for cancer treatment. Another well-known photochromic molecule, spiropyran, has also been extensively utilized. Specifically, spiropyran moieties can undergo a reversible transformation from colorless state to pink-colored zwitterionic merocyanine state upon UV light irradiation (< 420 nm), which can be easily reversed under visible light irradiation (> 450 nm). This structural conversion of spiropyran from hydrophobic to hydrophilic can induce significant solubility change for photo-triggered therapy and imaging. For instance, Chen and co-workers reported a light responsive drug release MSNs nanoplatform by adjusting the wetting behavior of hydrophobic surface . Briefly, the surface of spiropyran modified MSNs were protected from being wetted by water which could successfully inhibit the release of anticancer drug (CPT). Upon 365 nm UV light exposure, the anchored spiropyran underwent reversible conformational switch from “closed” to “open” state that caused the surface to be wetted and thus subsequently released CPT for cancer therapy. Daniel and co-workers also demonstrated an interesting spiropyran-based photoswitching nanocarrier that used UV/visible light to remotely control the reversible size change and effective antitumor drugs release . By right, this robust light responsive approach has been well recognized as an available candidate towards targeted therapy and imaging in vitro and in vivo. In the past decades, much attention has been paid to develop effective light-mediated strategies for therapy and imaging, mainly attributed to the attractive advantages of light activation, including controllable operation, spatiotemporal precision and lower expenditure. Until now, UV light is the most frequently used source for photo-induced therapeutic studies in vitro and in vivo. Despite the remarkable initial success, a few avoidable drawbacks, such as potential photodamage to living tissues and limited light penetration depth, have greatly restricted the extensive biomedical applications of UV light. In order to overcome these challenges, another commonly used strategy based on visible light-mediated strategy, which can cause less damage than UV light in living system, has been proposed as an alternative to light-activated therapeutic studies. Until now, a variety of visible light responsive organic moieties, such as vitamin B12 derivatives [62-64], trithiocarbonates [65, 66] etc., have been utilized for visible light-mediated drug delivery. For instance, Lawrence's group have reported a series of vitamin B12 derivatives for tuneable visible light-controlled drug activation and bioimaging in living cells (Figure 4A) . Since the cobalt(III)-alkyl (Co(III)-C) bond in vitamin B12 was quite weak (cleavage energy < 30 kcal mol-1), light in the range from 330 nm to 560 nm could be absorbed by the corrin ring to induce photocleavage of axial ligand (e.g., anticancer drugs, cyclic adenosine monophosphates (cAMP), fluorophores, etc). Therefore, upon appending different drugs or fluorophores to the corrin ring structure, a beam of light will be utilized to separate the Co(III)-ligand bonding of vitamin B12 derivatives for light-triggered imaging and therapy. Visible light-mediated drug delivery strategies. (A) Structures of vitamin B12 derivatives for tunable wavelength light-controlled molecules release. Reproduced with permission from reference . (B) Structures of photoactive [Ru(tpy)(5CNU)3]2+, tpy and 5CNU. Confocal images presented 5CNU ligands (green) could be released upon light irradiation in HeLa cells. Reproduced with permission from reference . (C) Scheme of visible light-controlled drug (PTX) delivery of Ru(II)-dppz complexes modified MSNs. Reproduced with permission from reference . 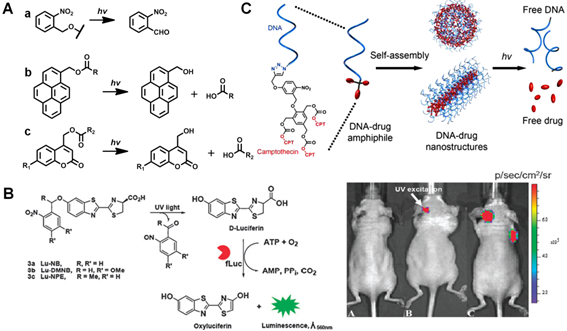 (C) Scheme of light-induced Dox release from DNA-AuNPs nanocomplexes for targeted cancer therapy. Reproduced with permission from reference . Furthermore, some transition metal compounds, such as ruthenium (Ru) complexes [67-69], have also been applied for light-triggered therapy through their tunable optical properties. For example, Sgambellone et al. reported a phototherapeutic agent, [Ru(tpy)(5CNU)3]2+, and investigated its light-induced binding to DNA upon visible light illumination (Figure 4B) . The photo-released 5CNU drug molecules and ruthenium fragment exhibited effective cytotoxicity through inhibition pyrimidine catabolism and DNA replication in the presence of light (> 400 nm) treatment. Howerton and co-workers synthesized a series of strained ruthenium complexes as novel antitumor agents for therapy . The complexes were stable and nontoxic in the dark, but exhibited great cytotoxicity for cancer cells upon visible light (> 450 nm) activation, which should be attributed to the rapid photo-cleavage of the attached ligands, thus inducing DNA cross-linking and inhibiting of proliferation in surviving cells. Similarly, apart from small molecule moieties, various types of functionalized nanostructures have also been proposed for visible light-triggered drug delivery [72-74]. Frasconi et al. recently presented a novel nanoplatform by grafting the Ru(II)-dipyridophenazine (dppz) complexes on the surface of MSNs (Figure 4C) . Under visible light irradiation, a monodentate ligand between MSNs and the Ru(II) complex could be cleaved, resulting in the photo-controlled release of loaded drugs (Taxol) to inhibit the mitotic progression and cell proliferation for cancer therapy. Interestingly, Xu et al. constructed a novel visible light-triggered drug delivery system based on double-layered stacked TiO2 nanotubes capped with hydrophobic AuNPs . Under visible light illumination, the AuNPs allowed for photocatalytic scission of the hydrophobic chain, leading to the rapid release of antibiotic drug ampicillin (AMP) and controllable antibacterial activity. Moreover, Luo and co-workers devised a smart drug carrier by using DNA-AuNPs conjugates for targeted drug delivery (Figure 4D) . Typically, the hairpin DNA (hpDNA) was first covalently conjugated on the surface of AuNPs and then Dox molecules were intercalated into the adjacent base pairs of hpDNA structures. Upon visible light illumination (e.g. at 532 nm, corresponding to the plasmonic resonance wavelength of AuNPs), the generated photothermal response assisted the rapid release of drug molecules from nanocarriers and resulted in enhanced antitumor activity. So far, the therapeutic strategies utilizing light as remote-controlled tools have received considerable attention due to their specific selectivity and spatiotemporal precision. The most widely used excitation sources for photo-triggered therapy and imaging are mainly based on the light irradiation at UV (< 400 nm) and visible (400-700 nm) wavelengths range. Basically, the short-wavelength light bearing high energy can cause disruption of chemical structures by either breaking the covalent bond or inducing trans-cis photoisomerisation. Despite their promising photo-induced theranostic application, the short-wavelength light may potentially suffer from limited tissue-penetrating capability, low signal-to-noise ratio and unavoidable photodamage, especially for the light illumination in UV region [78, 79]. Therefore, it is still challenging to develop more feasible alternatives that enable more precisely light-controlled therapy and imaging with deep tissue penetration and minimum cellular damage. Recently, a promising candidate, which uses light excitation at “NIR window” or “optical window” (700-1000 nm), has emerged to match the demand in clinics [80, 81]. The major light absorbers in living systems including water, lipids, and some intrinsic proteins such as hemoglobin (Hb) and oxyhemoglobin (HbO2), usually demonstrate minimum light absorption in NIR range. Therefore, the light excitation at NIR window may exhibit several unique advantages towards deep tissue penetration, low fluorescence background, and limited photo damage, which could thus greatly benefit photoactivated delivery in living systems. Currently, several promising strategies have been proposed for effective therapy and imaging on the basis of NIR light-mediated platforms [82-84]. One commonly used approach of using NIR light in biomedicine is to develop photosensitive drug delivery systems, which can respond to NIR light irradiation or convert NIR light excitation into short-wavelength emissions, to precisely control the release of therapeutic reagents through light-activated chemical structural change. Another well-established NIR light-mediated strategy is mainly based on the concept of photodynamic therapy (PDT), in which the nanomaterials will conjugate with photosensitizers (PS). Upon NIR light irradiation, the PS molecules can generate reactive oxygen species (ROS) based on the promising properties of nanomaterials, and thus achieve the targeted therapeutic effects in vitro and in vivo. 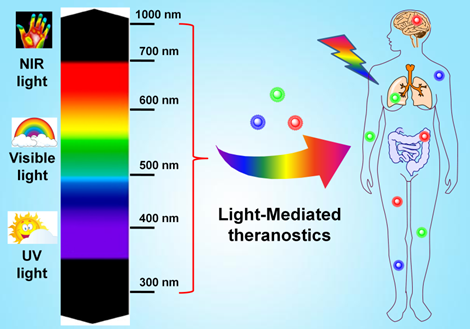 The third widely investigated approach, termed as photothermal therapy (PTT), is to directly convert NIR light illumination to heat by utilizing the strong absorption of thermal-sensitive agents for targeted diseases treatment. Herein, we briefly introduce the NIR light-controlled theranostic strategies including NIR light triggered drug delivery, PDT and PTT approaches for deep penetrating light-mediated therapeutic studies in vitro and in vivo. So far, the notable photo-activated therapeutic strategy is attributed to NIR light-mediated drug delivery platforms for chemophototherapy, which is an emerging technique for effective solid tumors treatment clinically in recent years . In this unique strategy, a beam of NIR light will be employed to induce the specific chemical structural change either by photocaging or photoisomerization of the light-responsive linkers between the drug molecules and delivery platforms, or by NIR light-induced temperature increase for controllable drugs delivery at the targeted disease areas. To this direction, one commonly used strategy is to involve the rational design of prodrugs, which usually integrate therapeutic molecules within multifunctional nanostructures through the linkage of photosensitive moieties. Upon NIR light illumination, the nanoplatform can be activated, and then subsequently induce photo-responsive chemical bond cleavage or conformational exchange, thus leading to effective prodrug activation in a spatiotemporal resolution. In the meantime to fulfill the light-mediated prodrug activation, these nanostructures can also work as smart delivery “cargos” to further improve the treatment efficacy by the enhanced permeability and retention (EPR) effect to direct higher concentration therapeutic agents to disease areas. So far, several types of NIR light responsive nanomaterials-based drug delivery platforms, including UCNPs , gold nanostructures [87, 88], carbon-based nanomaterials , porphyrin-phospholipid liposomes [89, 90] etc, have been extensively studied for NIR light-triggered delivery of various drugs (e.g., Dox, CPT, etc). Among the different nanomaterials for NIR light-mediated theranostics, UCNP, an amazing rare-earth lanthanide-doped nanoplatform, has attracted much attention owing to its impressive photophysical properties [91-97]. Basically, UCNPs can convert low-energy NIR light irradiation (usually at 980 nm) into high-energy UV or visible light through the non-linear multiphoton processes [95, 98-100]. The upconverted emissions at UV or visible window can effective cleavage the photo-responsive linker and activate prodrugs modified on the surface of UCNPs for therapy and imaging. In 2010, Branda and co-workers firstly reported the photocaged compounds functionalized NaYF4:Yb/Tm UCNPs that could undergo a 980 nm NIR light-controlled molecules release by the upconverted emission at UV range . Although this strategy was only carried out in organic solution, the pioneering investigation still impressed the researchers for further biomedical studies. In 2012, Xing and co-workers developed a novel NIR light-triggered UCNPs nanoplatform to control D-luciferin photoactivity remotely . In their design, the silica-coated UCNPs were covalently linked with o-nitrobenzyl (ONB) photocaged D-luciferin. Upon 980 nm NIR light illumination, the upconverted UV emission at 365 nm cleaved the photoactive ONB group and induced the photorelease of D-luciferin, which resulted in significant bioluminescence enhancement upon the reaction with the firefly luciferase (fLuc) reporter enzyme in in vitro and in vivo studies. Similarly, they also designed a NIR light-responsive mesoporous silica modified UCNPs drug delivery system for light-controlled drug (Dox) release in cancer cells . Upon 980 nm light irradiation, Dox could be selectively activated through the photocleavage of the capped ONB crosslinker by the upconverted UV emission from UCNPs, which provided a good example for effective light-triggered drug delivery in living system. Inspired by these pioneering studies, great possibilities for NIR light-triggered therapy and imaging have emerged in recent years. 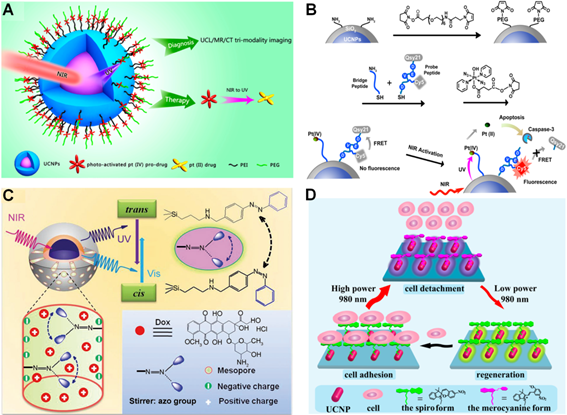 For instance, around the same time, Lin's and Xing's groups have independently developed the novel NIR light-mediated Pt(IV) anticancer prodrug delivery nanoplatforms based on UCNPs for remotely controlled prodrugs photoactivation under 980 nm light irradiation. In Lin's design (Figure 5A) , a novel photoactive Pt(IV) prodrug, trans, trans, trans-[Pt(N3)2(NH3)(py)(O2CCH2CH2COOH)2] was conjugated with a core-shell UCNPs complex (NaYF4:Yb/Tm@NaGdF4/Yb). Such photoactive drug delivery system not only exhibited significant in vivo antitumor efficacy upon 980 nm laser irradiation, but also provided multifunctional tri-modality imaging contrast agents for cancer treatment in living animals. While, in Xing's system , the silica-coated UCNPs were constructed as nanocarriers to covalent combine with Pt(IV) prodrug (trans, trans, trans-[Pt(N3)2(py)2(OH)(O2CCH2CH2COOH)]) and another apoptosis imaging peptide probe consisting of a fluorescence donor (Cy5) and a quencher (Qsy21) (Figure 5B). Upon 980 nm light illumination, the Pt(IV) prodrug was photo-activated by upconverted UV emission and induced effective cytotoxic activity in cancer cells. Moreover, the caspases enzymes triggered by cytotoxicity could effectively cleave the peptide probe to achieve optical imaging of apoptosis in living cells, making this nanocarrier an excellent biomarker for real-time cellular imaging and earlier evaluation of anticancer therapeutic efficiency. NIR light-triggered drug delivery strategies. (A) Scheme of NIR light-mediated UCNPs nanoplatform for Pt(IV) prodrug-based therapy and multimodal imaging. Reproduced with permission from reference . (B) Schematic illustration of 980 nm light-induced Pt(IV) prodrug photoactivation and intracellular apoptosis monitoring. Reproduced with permission from reference . (C) NIR light-triggered drug release from the mesopores of UCNPs@mSiO2 due to trans-cis azobenzene photoisomerization. Reproduced with permission from reference . (D) Scheme of power density controlled photoswitching for non-invasive cell adhesion/detachment. Reproduced with permission from reference . Another effective approach to control drug delivery with deep tissue penetration is depending on the design of NIR triggered photoisomerisation, which undergoes reversible conformation change and subsequently induces controllable drug release upon NIR light excitation. For instance, Shi et al. demonstrated a novel NIR light-mediated drug carrier based on mesoporous silica-coated NaYF4:Yb/Tm@NaYF4 core-shell nanostuctures (UCNPs@mSiO2) (Figure 5C) . The anticancer drug (Dox) was co-loaded with photoactive azobenzene groups into the nanoplatform. Upon 980 nm laser illumination, the upconverted UV (350 nm) and visible (450 nm) light from UCNPs resulted in reversible azobenzene structural alteration from trans to cis status and induced continuous rotation-inversion migration, which could thus drive light-controlled drug release in cancer cells. Additionally, another feasible NIR light-mediated drug delivery approach will rely on light switchable spiropyran molecule, which can respond to converted visible emission from UCNPs. To this direction, Qu's group recently reported an interesting design for NIR light-controlled cell adhesion/detachment reversibly by utilizing spiropyran conjugated multi-shell UCNPs (Figure 5D) . In this system, the conformational behavior of spiropyrans was only relying on the power density of 980 nm NIR laser excitation. High power density permitted the ring-opening while reversed to ring-closing status when upon lower power density excitation. Such smart NIR light-induced design switched the reversible interaction between spiropyran and cell surface protein (fibronectin), which therefore resulted in NIR light-regulated adhesion/detachment of cancer cells. Apart from the light-induced photo-responsive modalities on the basis of short-wavelength upconverted emissions, the generated heat from specific materials under NIR light irradiation has also been broadly used as another alternative strategy to achieve light-triggered drug delivery in extensive therapeutics. Typically, the rational design will involve in the unique functional materials that can absorb NIR light photon energy and subsequently convert it to thermal energy based on their specific absorption capability in the NIR regions. Such locally produced heat can induce significant temperature increase in the pathological regions, which thus lead to rapid drug release from the carriers. Recently, numerous photo-to-heat transducers, including AuNPs , CuS , MoS2 , carbon-based nanomaterials  and some hybrid nanostructures (e. g. Au-Ag NPs , Silica-Au NPs , Graphene oxide (GO)-Au nanorods , GO-silica , etc), have been widely fabricated for the heat induced drug delivery. More importantly, several functional materials, including polymer , liposomes  and biomolecues  etc, have also been reported to endow these novel nanomaterials with desired properties. For example, Xia's group constructed a nanoplatform for NIR light-triggered drug release through the photothermal effect of smart polymer (pNIPAAm-co-pAAm copolymers) coated gold nanocages (Figure 6A) . The proposed gold nanocages could efficiently convert excited NIR light to thermal energy and lead to the collapse of polymer chains when the temperature was more than LCST, termed as low critical solution temperature (LCST), and thus released the loaded drugs into surroundings for cancer treatment. 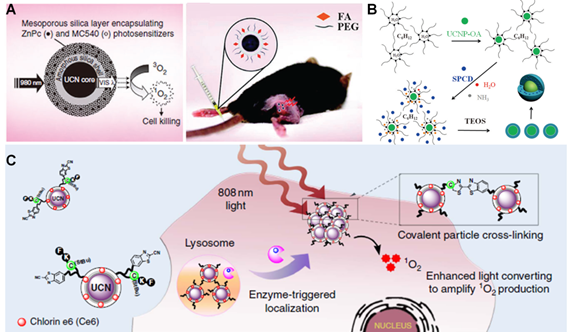 Yeh's group demonstrated a promising hybird nanoplatform (Fe3O4@Au@mSiO2) to perform NIR light remote-controlled drug (Dox) release in tumor regions . As shown in Figure 6B, the double-stranded complementary oligonucleotides (referred as dsDNAs) were used as pore blockers to encapsulate the anticancer drugs. Upon heating Fe3O4@Au@mSiO2-dsDNA/Dox by 808 nm NIR light irradiation, the dsDNAs were unwound on the surface of MSNs to release loaded drugs for effective cancer treatment. Nowadays, NIR light-mediated drug delivery platforms have been well recognized as effective therapeutic approaches to treat various diseases. Besides the strategies based on the photo-activated prodrug design or the thermal processes for controlled drug release, another well-established unique type of therapeutic modality is photodynamic therapy (PDT), which relies on PS agents to generate ROS (e.g., peroxides, superoxide, hydroxyl radical, single oxygen (1O2), etc) upon light irradiation. These active oxygen species are usually associated with oxidative stress and subsequently cause significant cellular damage by degrading the components in cells, like DNA, certain enzymes or proteins [121, 122]. Compared to traditional therapeutic modalities such as chemotherapy and radiotherapy, PDT exhibits great advantages especially in cancer therapy due to its intrinsically non-invasive safety and highly spatiotemporal selectivity after light irradiation. Therefore, PDT has been well developed as a viable therapeutic option for effective cancer treatment and been approved by the FDA in recent decades [123, 124]. In general, the application of PDT in clinic could be restricted by two main aspects. First, the most PS agents employed in conventional PDT are hydrophobic molecules that contain porphyrins or their analog structures, which may usually suffer from limited accumulation efficiency at the targeted regions due to their poor water solubility. In order to improve the therapeutic efficacy of PDT, many nanomaterials-based carriers have been proposed to facilitate the PS agent delivery in targeted disease areas in living system. Another potential shortcoming of traditional PDT is the limited tissue penetration of excitation light source because most of the PS agents are only responsive to short-wavelength light irradiation. In an attempt to solve this problem, recently, extensive efforts have been invested in PDT studies to explore the feasibility by utilizing long-wavelength NIR light mostly attributed to its capability for deeper tissue penetration, which could significantly improve the safety of PDT treatment by effectively reducing the possible light-induced cytotoxicity in living systems. Despite numerous NIR light-responsive PS molecules have been developed for PDT in clinic [125-127], several unavoidable drawbacks, such as troublesome synthetic procedures, low water solubility and limited accumulation abilities in targeted areas, heavily restrict their clinical applications in deep-tissue therapeutic and imaging studies. Therefore, various kinds of nanomaterials with large extinction coefficient in the NIR window, including organic NPs (e.g., lipsomes , polymeric NPs , etc) and inorganic NPs (e.g., UCNPs , gold-based NPs , carbon-based NPs , etc), have been extensively explored for PDT applications both in vitro and in vivo. NIR light-triggered heat-induced drug delivery approaches. (A) Schematic illustration of the smart thermal responsive system. TEM images showed the morphology of Au nanocages. The increased absorption spectrum presented the controlled dye release from the Au nanocages upon a pulsed NIR laser (10 mW/cm2) irradiation for 1, 2, 4, 8 and 16 min, respectively. Reproduced with permission from reference . (B) Scheme of the 808 nm light-mediated nanocomposites synthesis for therapy in vivo. Reproduced with permission from reference . NIR light-mediated PDT strategies. (A) Scheme of FA/PEG modified UCNPs@mSO2 loaded with ZnPc and MC540 for PDT. Reproduced with permission from reference . (B) Schematic illustration of UCNPs coated with PS-doped silica shell for PDT. Reproduced with permission from reference . (C) Scheme of tumor microenvironment sensitive approach for covalent cross-linking of peptide-modified UCNs in cancer treatment. Reproduced with permission from reference . Typically, as a promising candidate, lanthanide-doped UCNPs, which can convert NIR light into broad UV/visible emission to activate several kinds of PS agents, provide a powerful tool to overcome the major drawbacks of current PDT strategies with NIR light-triggered applications. For instance, in 2007, Zhang et al. firstly reported that silica-coated UCNPs could act as an energy transducer to induce PDT therapeutic effect in living cells under NIR light irradiation . In 2012, Zhang's group presented a smart UCNPs-based PDT treatment strategy by incorporating two types of PS molecules, Zinc phthalocynanie (ZnPc) and MC540, into one single core-shell mesoporous silica coated UCNPs nanoplatform (Figure 7A) . Upon 980 nm laser irradiation, the two main upconverted emissions, green (~540 nm) and red (~660 nm) light, simultaneously excite the loaded ZnPc and MC540 molecules respectively, thus resulted in enhanced PDT efficiency. After coating with tumor affinity ligand, e.g. folic acid (FA), the UCNPs nanoplatform exhibited effective tumor accumulation for promising NIR light-mediated PDT treatment effects in vivo. Moreover, some interesting studies have also been proposed to improve the PDT effect in hypoxia tumor environment. It is well known that the presence of hypoxia regions in human tumors with low levels of oxygen would be the bottleneck of PDT therapy because these deep-seated tumor cells in the hypoxic regions are resistant to both chemotherapy and light-triggered therapy, which significantly affect cancer treatment efficacy [135, 136]. In an attempt to solve this problem, recently, Shi and co-workers constructed a double silica-shelled Gd3+-doped UCNPs nanoplatform that are able to co-delivery of PS molecules (e.g. silicon phthalocyanine dihydroxide, SPCD) and a bioreductive prodrug (tirapazamine, TPZ) (Figure 7B). In fact, the TPZ prodrug could be stimulated by various intracellular reductase enzymes to produce highly cytotoxic free-radical intermediate species under hypoxic conditions . Upon 980 nm laser illumination, a remarkable tumor therapeutic effect was achieved owing to UCNPs-based PDT under normal oxygen environment followed by the TPZ-induced cytotoxicity when oxygen is exhausted by PDT under hypoxia tumor environment. The great tumor growth inhibition in animal experiments demonstrated the highly effective synergetic cancer therapy of this bioreductive TPZ-PDT system. Chen's group also presented a unique rattle structures of organosilica shell modified β-NaLuF4:Gd/Yb/Er nanoprobes loaded with PS molecules for effective PDT and dual-modal imaging . Upon NIR light irradiation, the energy transfer from UCNPs to PS facilitated the 1O2 generation, thus inducing an enhanced PDT effect for cancer treatment. Although the NIR light-mediated PDT approaches have attracted significantly interest in recent years due to the promising optical properties of UCNPs, most current UCNPs-based strategies mainly rely on the 980 nm NIR light, which would likely cause the concern of unavoidable overheating effect owing to the strong water absorption at this wavelength [27, 139]. Therefore, great efforts have been made to convert the excitation light of UCNPs to a shorter wavelength range in medical spectral window (e.g., 700-900 nm). Recently, Nd3+-doped UCNPs with ~800 nm excitation have been investigated to minimize the undesirable overheating effect [140-143]. By taking this promising advantage, Xing and co-workers recently presented a unique tumor environment responsive UCNPs nanoplatform with the surface modified by enzyme sensitive peptide (Figure 7C) . Upon tumor-specific enzyme reaction, the cleaved peptides would induce the covalent cross-linking of neighboring particles which triggered the accumulation of UCNPs at tumor site. Upon 808 nm laser irradiation, such enzyme-triggered UCNPs cross-linking resulted in the enhanced upconversion emission and subsequently amplified ROS generation, which thus greatly improved PDT treatment and multimodality cancer imaging including optical and PA imaging techniques for theranostics in vivo. NIR light-mediated PTT strategies. (A) Scheme of the formation of biodegradable gold vesicles for PTT therapy and PA imaging. Reproduced with permission from reference . (B) Scheme of self-assembled HAS-ICG-PTX nanocomposite and thermal images of tumor-bearing mice injected with HAS-ICG-PTX, HAS-ICG or PBS under the 808 nm laser irradiation. Reproduced with permission from reference . Within the past decade, NIR light-mediated drug delivery and PDT therapeutic strategies have been well explored for effective diseases treatment in living system. Apart from them, another outstanding strategy, PTT, has also attracted much attention in recent years, especially in the process of tumor treatment in vitro and in vivo. Generally, PTT employs photothermal conversion agents (PTCAs) to convert excited NIR light into heat energy in localized region. Such process will lead to the overheating of disease areas, promote the damage of surrounding biological species and cause subsequent cell death [145, 146]. The expected PTCAs should at least include several features: 1) strong NIR light absorption; 2) great photothermal conversion efficiency; 3) excellent biocompatibility and biodegradability; 4) real-time visualization for therapy [147, 148]. Until now, several promising PTCAs, including inorganic nanomaterials [149-158] and organic polymers [116, 159], have been widely employed for effective NIR light-triggered PTT treatment in vitro and in vivo. For example, Chen's group reported a talented theranostic platform through biodegradable AuNPs for PA imaging and PTT (Figure 8A) . Basically, the disulfide bond (S-S) at the terminus of a poly(ethylene glycol)-b-poly(ɛ-caprolactone) (PEG-b-PCL)-tethered block-copolymer graft enabled assembling of AuNPs to induce significant plasmonic coupling between adjacent AuNPs, thus resulting in highly effective PTT treatment upon 808 nm NIR laser irradiation in living mice. Liu et al. fabricated a novel 2D nanocomposite by self-assembly of iron oxide nanoparticles (IONPs) on MoS2 nanosheets and then modified with PEG to acquire increased stability in physiological conditions . Interestingly, after firmly adsorbing 64Cu on the surface of MoS2 nanosheets, the composited MoS2-IO-PEG nanoplatform permitted triple-modal imaging guided therapy, including magnetic resonance imaging (MRI), and other imaging modalities including positron emission tomography (PET) and PA tomography (PAT). Moreover, upon intravenous injection, the nanocomposite achieved effective tumor ablation with NIR light-triggered PTT in animal experiments. Despite the great therapeutic effects in preclinical studies, the inherent non-biodegradable properties and long-term biosafety of these inorganic nanomaterials may potential limited their future clinical application. Several alternative PTT agents, such as NIR-absorbing organic nanomaterials including NIR dye labeled micelles [162-164], conjugated polymers , porphysomes  and organic-inorganic nanocomposites [167, 168] etc, have been widely investigated in the past decades. For example, Liu's group reported a new theranostic agent that self-assembled HSA encapsulating PTX and indocyanine green (ICG, a FDA-approved NIR dye) into stable nanoplatform for synergistic therapeutic study (Figure 8B) . In this system, HSA was a biodegradable carrier loaded with PTX as an anticancer drug and ICG as both imaging/PTT probes. The results demonstrated that HSA-ICG-PTX nanocomposite displayed great stability with long-time blood circulation and achieved excellent synergistic therapeutic efficacy in vivo. In addition, Zheng's group recently reported the development of porphysomes, the nanovesicles self-assembled from porphyrin bilayers, which have been found to indicate high NIR light absorption and excellent biocompatibility . Their results demonstrated that porphysomes nanovesicle could effectively accumulate in tumor regions of mice and induced distinct tumor ablation upon NIR light irradiation, which shown potential applications for multimodal imaging and PTT treatment in vivo. Nowadays, numerous light-mediated therapeutic strategies have been widely developed and investigated with promising perspectives for effectively deep-penetrated disease therapeutics and diagnosis in clinics. Moreover, tremendous efforts are also continuing to fabricate novel approaches with better tissue penetration depth and higher spatiotemporal precision in therapy and imaging. Until now, several light-assisted techniques have been emerged for diagnostics and therapeutics towards deep-seated disease treatment by conjugation light-mediated strategies in vitro and in vivo [171, 172]. Herein, we mainly introduced two kinds of light-assisted new techniques in theranostics. Among the various noninvasive techniques to achieve deep tissue penetration, ultrasound is widely recognized as an efficient biomedical diagnostic imaging modality in hospitals due to its inherent deep-penetration properties (e.g., < 20 cm) [173, 174]. It has been extensively utilized in clinics to provide valuable information of internal body structures such as muscles, tendons, joints, vessels, organs, and practice of examining pregnant women with obstetric ultrasound for prenatal care in recent decades [175, 176]. Recently, a brand-new technique, PA imaging, which integrates NIR light excitation and ultrasound imaging into one system, has been developed as a new kind of imaging modality to provide deep-tissue penetration and strong PA signals from endogenous or exogenous contrast agents with high resolution in living systems [177, 178]. As shown in Figure 9A, upon laser irradiation, a part of light is absorbed by the contrast agents and converted to localized heat, followed by the generation of a pressure rise through thermo-elastic expansion. Such pressure rise is propagated as an acoustic wave with the ultrasound frequency in the biological tissues, which can be captured by surrounding ultrasonic transducers for PA imaging in deep-seated regions . Therefore, due to these promising properties, PA imaging may overcome the limitations of conventional optical imaging (e.g., limited tissue penetration depth) and ultrasonic imaging (e.g., low contrast for diagnosis), making it an outstanding clinical imaging method in biomedical fields [180, 181]. Moreover, benefited from the great absorption of NIR light, various photothermal regents as aforementioned also can be utilized as ideal contrast agents for PA imaging [182-184]. For example, a promising semiconducting conjugated polymer nanoparticles (SPNs) that have strong NIR light absorbance have been reported recently, which could act as a new class of contrast agents for PA imaging (Figure 9B) . These SPNs exhibited considerable PA signal than gold nanorods and SWNTs on a per mass basis, and could make them an ideal contrast agent for whole-body lymphnode PA imaging in living mice. Chen's group also constructed a novel multimodality imaging nanoplatform based on ultrasmall (< 10 nm) water-soluble melanin nanoparticle (MNP), which indicated unique properties for PA imaging and innate binding abilities with various metal ions (e.g., 64Cu2+, Fe3+, etc) for multifunctional imaging . Moreover, they further modified cyclic-RGD peptide on MNPs surface to achieve specific conjugation with tumor overexpressed αvβ3 integrins. The animal experiments also demonstrated that these multifunctional MNPs had great potential for molecular theranostics and clinical translation. Recently, Lovell's group reported a promising probe, phosphorus phthalocyanine (P-Pc), which could reduce the light scattering based on its long wavelength absorption band beyond 1000 nm for deep-tissue and high quality PA imaging in vitro and in vivo . It was demonstrated that P-Pc could accumulated passively in tumor areas by EPR effect after intravenous injection in mice. It could also been used for non-invasive intestine PA imaging of mice by oral administration. Moreover, further studies were also conducted by external placement of the P-Pc under the arm of healthy adult human. The results demonstrated that the PA signal could be clearly visualized through the entire 5 cm limb to show strong capability for deep-tissue PA imaging in humans. Based on these inspiring results, the promising PA techniques have the potential to be used in therapeutic studies in the near future. PA imaging based diagnosis in vivo. (A) Brief scheme of the mechanism of PA signal production. (a) Structure of 128-element hemisphere array-based PA tomography. (b) PA imaging of blood vessels in a living mouse ear. Reproduced with permission from reference . (B) Design of photo-activated probe (a) for ROS monitoring with PA imaging in mice (b). Reproduced with permission from reference . Besides the imaging modality based on ultrasound, numerous noninvasive stimulations, such as magnetic field, ionizing radiation, etc., have also been explored to achieve deeper tissue penetration for therapy and imaging with highly spatiotemporal resolution in clinics [9, 171], which are considered as novel techniques to create new generation of light-assisted therapeutic strategies. Among these promising candidates, X-ray has attracted most attention since Mr. Roentgen discovered this exciting radiation in the late 19th century . Considering the significant benefits in safety and precise examination, and importantly, almost limitless penetration capacity when compared to conventional optical imaging approaches, X-ray can be used as robust technique in radiotherapy and diagnosis with suitable dose of radiation for its extremely deep-tissue penetration (usually at 20-45 cm) in hospitals . Until now, several inspiring radioactive or nuclear imaging modalities, such as computed tomography (CT) [190, 191], positron emission tomography (PET) [192, 193], single photon emission computed tomography (SPECT) [194, 195] etc. have been widely applied in clinics as nuclear medical diagnostic techniques. Currently, the ideal theranostic agents, which can integrate multi-modalities into one entity, are expected to exert multi-functional application in therapy and imaging. Fortunately, nanotechnology can address this challenge which benefits from its excellent advantages to achieve precise diagnostics and therapy in clinics [196-198]. For example, Lovell's group recently reported a porphyrin phospholipid coated UCNPs (PoP-UCNPs) multifunctional nanoplarform that could be used for six modalities imaging (Figure 10A) . In this typical multi-modality imaging platform, PA and FL imaging provided particular information of the self-assembled nanocomposites. CT and PET modalities permitted the imaging capabilities with deep-tissue penetration. Moreover, upconversion (UC) and Cerenkov luminescence (CL) imaging could achieve effective non-invasive signal detection at intermediate penetration depths. Animal experiments clearly suggested that PoP-UCNPs could be successfully utilized for in vivo lymphatic imaging with hyper-integrated hexamodal imaging modalities. In addition, Shi's group also developed rattle-structured multifunctional silica-coated UCNPs platform for delivering cisplatin drug to tumors with synergetic chemo-radiotherapy and MRI/luminescent dual-mode imaging modalities, which presented a novel diagnostic strategy in biomedical fields to achieve optimal therapeutic efficacy in cancer treatment . By taking advantage of unique properties of multifunctional nanomaterials, an emerging light-assisted hybrid modality, Cerenkov radiation (CR), which integrates radioactive X-ray and light-mediated techniques in one platform, has recently attracted much attention in nuclear medicine owing to its deep tissue penetration in disease treatment [199-202]. Briefly, upon X-ray irradiation, the optical photons, also termed as CL, are produced when a charged radioactive particle travel faster than the speed of light in a dielectric medium. As a fascinating optical phenomenon, the CR derived from radioactive contrast agents are performed in highly sensitive optical imaging equipment, which may facilitate the light-assisted therapeutic application in clinics. For example, Grimm et al. demonstrated that it was feasible for the absorption of CR for small-molecule probes and nanoparticles-based contrast agents (Figure 10B) . They fabricated a smart approach that utilized the strong absorption of magnetic nanoparticles to modulate the CL from 2-[18F]Fluoro-2-deoxy-D-glucose ([18F]-FDG) through quenching. This nanoplatform provided specific contrast for dual readout of disease biology anatomically and molecularly, which enabled CR to be an effective technique for diagnosis in vivo. (A) Schematic design of the PoP-UCNP structure. The animal imaging shows the mice injected with PoP-UCNPs and imaged in six modalities after 1 h injection, including (a) FL, (b) UC imaging. (c) PET, (d) PET/CT and (e) CL imaging, respectively. Reproduced with permission from reference . (B) Scheme of CL generation and nanoparticle induced quenching of CL. The animal imaging presents fluorescent imaging (a, b) and CR imaging (b, d) of mice injected with PBS and Cy5.5 labeled probe. B; bladder. Reproduced with permission from reference . Currently, precision theranostics in biomedical studies have been extensively required for more effective treatment and diagnosis of various human diseases in clinics. So far, unique strategies to achieve highly selective drug delivery into disease areas and minimum side effects in the process of treatment still remain challenging, which inspires the rational design of “smart” platforms toward the efficient therapeutics and diagnostics in further biomedical applications. Nowadays, numerous stimulus-responsive theranostic systems have been extensively investigated for the treatment of various types of diseases with improved selectivity, enhanced therapeutic efficiency and less toxic effects. Among them, light-mediated strategies have been well established to control drug delivery and bioimaging in clinics due to their promising properties, such as noninvasively therapeutic method, precisely controlled modality, and more importantly, highly spatiotemporal resolution. Up to now, different light-triggered strategies including photo-controlled drug release, photothermal and photodynamic therapy have been proposed for the effective activation of theranostic contrast agents in a broad wavelength range from UV/visible to NIR windows. Basically, most drug delivery platforms employ short-wavelength light (e.g., UV or visible light with high energy photon) to cleave a photocaged linker or induce a trans-cis isomerization for effective release of the loaded drugs in desired areas. However, the inherent drawbacks of short-wavelength light, such as potential phototoxicity, high autofluorescence background and limited tissue penetration depth, may significantly restrict their further biomedical applications. Fortunately, the recent emerging NIR light-activated techniques could overcome these limitations and enable remote-controlled theranostics due to their unique properties, including less harmful effects on normal tissues and better penetration depth in vivo. Moreover, the rapid evolution of robust nanomaterials (e.g., AuNPs and UCNPs, etc) with specific capabilities offers promising perspectives for achieving precisely NIR light-controlled platforms in biomedical applications. Therefore, NIR light-mediated therapeutic and imaging strategies have been widely explored in vitro and in vivo. More importantly, several recent innovations that integrate light and other stimulus responsive techniques, such as PA and CR techniques, could greatly match the current demands for localized and non-invasive disease treatment. Despite a lot of light-mediated theranostic studies have been widely reported in recent years, there is still a long way toward conducting clinical application of photo-based disease diagnosis and therapy in hospital to benefit public healthcare system. Therefore, several challenges still need to be addressed for further clinical applications of light-mediated theranostics in the next decades. First of all, despite the NIR light-mediated therapeutic strategies have been widely established with the minimum photodamage and enhanced penetration depth in living tissues, most photo-responsive agents for therapy and imaging are still activated by short-wavelength light with high energy, especially for the breaking of chemical bond in photocaged molecules upon light irradiation. Although some promising nanomaterials (e.g., UCNPs) can convert the NIR light to short-wavelength light, the conversion efficiency remains insufficient (usually the quantum yield < 1%) [140, 204]. Therefore, researchers should pay more attention to the developments of new types of nanostructures with enhanced photo-to-photo conversion efficiency, which will significantly improve the effectiveness of light-mediated therapy and imaging. Secondly, although lots of nanomaterials have been demonstrated to achieve great therapeutic efficiency in light-mediated preclinical studies, most of them, especially for the inorganic nanostructures, are facing challenges due to their potential biosafety issues, such as non-biodegradable abilities and side effects of long-term retention inside the body after treatment process . Despite numerous studies have reported that the biocompatible surface coating (e.g., polymer, silica, etc) can decrease the toxicity of inorganic nanomaterials in living animals, the long-term safety in clinics is still under the cautious examinations. Therefore, the developments of novel biodegradable and safe therapeutic nano-agents, such as biodegradable polymer or carbon-based nanomaterials, etc, are highly demanded for light-controlled therapeutics and diagnostics in near future. Thirdly, even though the light-mediated therapy and imaging studies based on the advance of nanotechnologies have provided great possibilities to solve the current technical barriers, there may be still a long journey ahead to get the FDA approval of these therapeutic nano-agents in clinics. The toxicological behaviors of various nanomaterials in the vascular system of human body, such as potential immune response, bio-distribution and toxicity in organs, hepatobiliary and renal excretion, etc, are demanding to further investigation . Moreover, a systematic understanding of the human body responding to different external stimulations (e.g., light, ultrasound, X-ray, etc.) is essential which can provide important insights into the fabrication of appropriate photo-activated platforms for therapy and imaging in living systems. So far, light-mediated theranostics along with the development of novel nanotechnology and various light-assisted techniques provide a bright future for the precision medicine in clinical applications. With all the innovations in these research fields, we believe that effective deep-tissue theranostics based on these promising photo-mediated strategies will be developed continuously in the future and finally benefit human health. This work was partially supported by Start-Up Grant (SUG), Tier 1 (RG 64/10), (RG 11/13) and (RG 35/15) awarded in Nanyang Technological University, Singapore. Corresponding author: Bengang Xing (Tel: +65-63168758; Email: Bengangedu.sg).